Located only two hours from downtown DC, Gettysburg is probably the most well-known Civil War battlefield in the nation. Originally begun as a memorial in 1864, the battlefield was established as a National Military Park in 1895 and transferred to the Department of the Interior’s National Park Service in 1933. The quite Pennsylvania countryside around Gettysburg became the turning point of the Civil War during three days in July 1863. When the smoke settled and the clash of arms subsided, over 20,000 soldiers were injured and close to 50,000 were casualties of the brutal fighting. In the end, Lee’s Army of Northern Virginia was a broken force; the South would never recover from the defeat. Visitation to the park is free; driving around the battlefield can take all day, especially for Civil War buffs. However, the NPS does make available a self-guided auto tour and tape tours (for small fees) to assist you as you drive the park. Personalized tours are available through the Licensed Battlefield Guide service, where a guide will drive your car around the park and point out various features and historical markers around the park. These guides are first-come-first served, so get there early if you wish to avail of this moderately-priced service. For the more technologically savvy, podcast tours are available for download for walkers / hikers and drivers. These are more landmark-centric and not really suitable for an all-day park tour. Those who wish to stay indoors (especially during the typically hot and humid Pennsylvania summers) can avail themselves of the park’s Museum and Visitor Center (open 8 – 7 daily during the summer); the Center recently went under relocation and reconstruction. Though it opened to the public back in April, a grand opening is scheduled for this September. 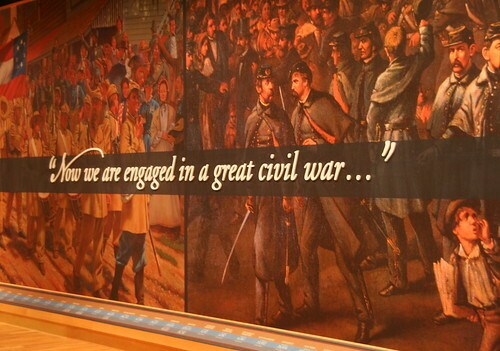 The Center hosts a museum on the Civil War from its beginnings and features a massive collection of both war and battlefield artifacts. Those who remember the old center and Cylcorama should beware, however, as the old building on Taneytown Road has been closed; all of its exhibits have been moved to the new Center. There’s a lot to Gettysburg. The park not only commemorates the battle and subsequent Gettysburg Address; it also offers photographers and hikers a natural and cultural setting that exhibits the beauty and simplicity of this portion of Pennsylvania. Not to mention offering a vast museum of monuments and memorials that compliment the battlefield landscape. It’s an easy day trip and a great excuse to get out and enjoy the coming fall weather. So pack a picnic and grab your camera before you head out. Enjoy the landscape and the history; the collision of nature and significance can often help us regain perspective. We’re fortunate to have such a place right near our front door.